Kate At the Q Awards – Latest Updates! Kate’s appearance at the show certainly caught fans by surprise, and there has also been quite a splash made across the media as a result of the award. In today’s UK newspaper The Daily Express, there is a half page feature (above) under the headline: “Blast From Past As Kate Bush Says: I’ll Be Back” It goes on to write: “Reclusive Star Gets Top Award And Makes Promise To Fans”. The paper quotes Kate as saying: “I know that it seems like a long time but I really have been working on making a new album. If it seems like it’s taking a while it’s because I’m really enjoying spending time with my son. He’s the most important thing in the world to me. Getting this award has been amazing and I thank everyone who voted for me. My albums have always taken me a long time to record but I hope this one will be ready next year”. Q Magazine’s own website has ran a story: “Kate Bush To Return – New LP on the way”. It says that she also thanked Dave Gilmour and Elton John for their help and guidance through her career, adding a special thanks to her father for “putting up with me banging on all those years ago”. Reuters news agency reports: “Kate Bush won the Q Classic songwriter award to mark nearly 25 years in the charts with singles such as “Wuthering Heights” and “Running up that Hill”. Channel 4’s Teletext service “PS News” quotes John Lydon (aka Johnny Rotten) at the ceremony: “I want to say hello to Kate Bush, who is brilliant!”. The service also mentioned Kate’s award under the headline “Kate Plans New Album”. A “well-behaved” Liam Gallagher was apparently among the first to rise to his feet to applaud Kate, according to DotMusic. The Sun newspaper also run a picture of Kate today and mention the “huge cheers” she received from the audience. 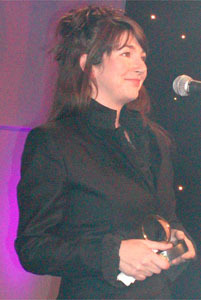 Also, from The Independent newspaper: “[…] But while the attendant stars, including New Order, Super Furry Animals, Coldplay, Feeder and Liam Howlett from The Prodigy, refused to be roused by Lydon’s lone antics, the room rose united to give a standing ovation to Kate Bush, who won this year’s Classic Songwriter award – and whom even Lydon graced with complimentary words.” (thanks to Michael Leitz). Highlights of the awards will be shown at 10.15pm Saturday November 3rd on UK Channel 5. This entry was posted in Awards, Books & Magazines, Kate Bush news, Other artists. Bookmark the permalink.